Retrievable IVC filters are used to treat patients temporarily for pulmonary embolism (PE) prophylaxis, including those facing prolonged bedrest following lower-limb surgery. The devices may be removed to prevent the risk of long-term complications once there is no immediate risk of thromboembolism, with medical management superseding cardiovascular interventions.¹ Complications can include filter fracture, embolization, caval penetration, and, ironically, an increased incidence of recurrent deep vein thrombosis after filter placement.¹ Regular patient follow-up is critical for optimal outcomes, along with periodic chart reviews and multiple attempts to contact patients.¹ Inferior vena cava filters, particularly those in place for many months or years, can embed themselves in surrounding tissue, but novel techniques can often succeed in even the most complicated IVC filter removal cases. 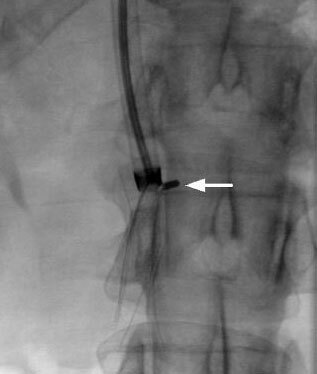 These techniques were developed in response to the rapid increase of retrievable IVC filters. “In 1999 when retrievable filters were approved in the United States, their use exploded,” says Lynch. “For example, in 2012, more than 250,000 devices were placed, up from 10,000 just a few years before. However, national retrieval rates remained low, just 15 to 20 percent.” In 2010, the FDA issued a statement strongly urging improved follow-up with these patients, many of whom began to suffer long-term complications, a position they reiterated in 2012. The FDA also challenged device manufacturers to provide additional long-term clinical data to justify the use of their retrievable IVC filters. In the future, Lynch hopes these data and advanced techniques will dispel the prevailing belief that IVC filters cannot be safely removed. Lynch FC. A Method for Following Patients with Retrievable Inferior Vena Cava Filters: Results and Lessons Learned from the First 1,100 Patients. J Vasc Interv Radiol 2011;22:1507–1512. Lynch FC. Balloon-assisted Removal of Tilted Inferior Vena Cava Filters with Embedded Tips. J Vasc Interv Radiol 2009; 20:1210–1214. Lynch FC. Modified Loop Snare Technique for the Removal of Bard Recovery, G2, G2 Express, and Eclipse Inferior Vena Cava Filters. J Vasc Interv Radiol 2012; 23:687–690.